Living National Treasure Onishi Isao (b. 1944), who specialises in urushi (lacquer) is truly an independent soul with a unique philosophy. Self-taught, he creates wonderfully perfect, large urushi dishes and bowls using the ‘hoop built core’ (magewa-zukuri) technique of bending strips of aged wood into rings and fitting them tightly together. In his studio in Ibaraki prefecture, Onishi works on his own, making everything by himself, including all of his tools and work surfaces. He even gathers his own urushi, which is a labour staking process, and carefully prepares the toxic liquid before applying it to his finished wooded forms. Onishi is the perfect embodiment of waza, the act of creation through process and skill. I had the pleasure of meeting and working with Onishi during the preparation for and exhibition of Crafting Beauty in Modern Japan, which was held at the British Museum in 2007, and jointly organised with the Crafts Gallery, Tokyo National Museum of Modern Art. The exhibition was a resounding success for the British Museum — their first major exhibition of contemporary Japanese craft. Over 43,000 visitors paid to view the exhibition in the Great Court, the prime temporary exhibition space of the British Museum. It was the most popular Japanese special exhibition held in the British Museum up to that point and the catalogue was reprinted to keep up with demand during the exhibition. Fascinating for me as a guest curator working on the exhibition in Japan as well as in Britain was the differing perceptions of what defined ‘craft’ and the nature of its relationship to art. One major difference between art and craft in Europe involves the issue of functionality. Craft is essentially seen to be functional. Questions regarding the function of the objects in the Crafting Beauty exhibition were constantly asked by visitors. The exhibition attempted to address this issue through didactics and the use of visual material, such as large-scale images of an urushi box by Murose Kazumi filled with the appropriate food, a kimono by Moriguchi Kunihiko being worn by a woman who was walking and the display setting for a glass box by Ishida Wataru. Onishi was instrumental in bridging the gaps in perception and definition. He was one of the four specially invited Living National Treasures tasked with holding a demonstration of their waza. 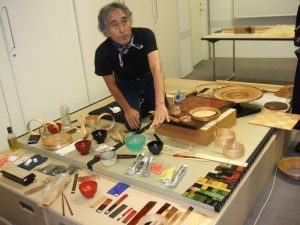 Onishi captivated the European audiences through his amicable nature and insightful explanation of the complex urushi processes. 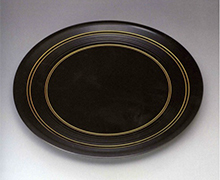 Japanese urushi is rich in variety, often using multiple decorative techniques that are both subtle and sophisticated. Many techniques have been developed for creating urushi wares and ornamenting it over the centuries, some originating in China and Korea and others originating in the Japanese archipelago. Onishi creates works using his hoop-built technique (magewa zukuri) and his urushi coating technique (kyûshitsu) for which craft-skills he has been designated as a Holder of Important Intangible Cultural Property (popularly ‘Living National Treasure’) by the Japanese government since 2002. Both the techniques of magewa zukuri and kyûshitsu were used in 8th-century Japan and can be seen used in vessels stored in the famous 8th-century Shôsô-in repository at Tôdaiji in Nara. Many members of the audience were surprised at the length of time that these processes regularly take. 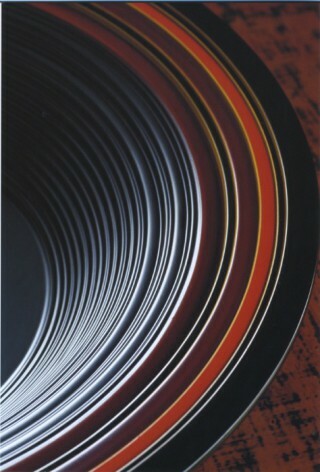 It can take Onishi up to seven months to create a major work, such as the deep black perfectly circular large dish in the British Museum’s collection (2014,3007.1). Onishi was asked why he laboriously hand planed each of the numerous multiple hoop bands that are needed to construct a dish instead of employing a much quicker mechanical process. Onishi replied that he does it this organic way because he enjoys the process. The questioner was at first a bit baffled at the answer. But then Onishi added that for him ‘The beauty is in the process and the final object is the sum of the path.’ We hope to bring Onishi back to Norwich and the UK in the near future for further demonstrations and discussion focussed on urushi and its possibilities and its future. Onishi was born in Nakama City, Fukuoka prefecture in 1944. His father was a carpenter and he grew up in the coal mining town leaving school at the age of 13. He had dreamed of being an aircraft designer but his lack of formal education precluded that possibility. After various positions when he was 25 years old he apprenticed under the Kamakura wood carving master Kiuchi Seigaku. 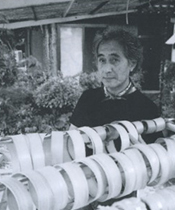 In 1974, five years after he had started his apprenticeship he went to hear a lecture by Akaji Yūsai (1906-84, designated as a Living National Treasure in 1974 for his ‘lacquer coating’ technique). That lecture was a major turning point for Onishi and he then went to study with Akaji for 10 years until Akaji passed away. Onishi has carried on developing the techniques he learnt from Akaji Yusai and teaches young urushi artists every other month in Wajima. Click here for step-by-step visual explanation of Onishi’s process. 1) Author unknown, ‘The Deep Beauty of Lacquer Ware: Creations by National Treasure Onishi Isao’ on Nippon.com. accessed 14 September 2015. 3) See here from the British Museum collection archive.